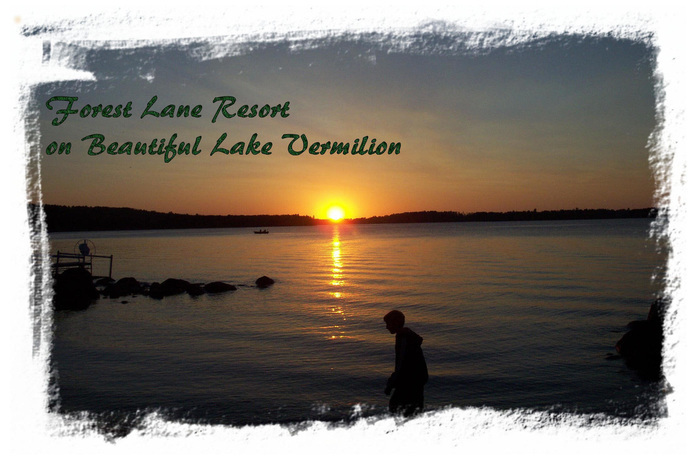 Forest Lane Resort is a small family owned, resort on beautiful Big Bay on Lake Vermilion. Our clean housekeeping cabins have full kitchens, fire places (in several), satellite TV, WIFI available, decks and Weber grills. We have a sandy beach, for swimming and sun bathing. There is a fire pit down by the lake so you can watch the fire and the stars each evening. We have 6 docks most with electric on them others with electric near by. Get your boat up and out of the water by renting a lift or you can use the dock for free. On the beach there is free canoes, kayaks, and paddle boats. Pontoon, fishing boat and row boats are available for rental. Need to roast a pig for a large family dinner? We have a large pig roaster; all you need is charcoal. Younger children can enjoy our playground and sand box, older children can play basketball, play on the beach , float around in the water or go fishing. We are pet friendly. Forest Lane Resort has hosted, several weddings on the beach, family reunions, scrap booking weekends, and soldiers leaving and returning from war. Bring your family and your relatives rent the whole resort for the week. Stay for an extended period of time and get a break on the rates. We are close to Fortune Bay Golf course, Vince Schute Bear Sanctuary, Orr Bog Walk, Ely Wolf Center, Bear Center, Soudan Underground Mine and our newest state park.